Arachidonic acid is both a product of the body’s natural linoleic acid conversion and, as the question notes, an existing (but modest) component of animal-based foods like egg yolk and meat – as well as human breastmilk. The particular beef with arachidonic acid revolves around its common conversion to omega-6 derived, “pro-inflammatory” eicosanoids, compounds (e.g. prostaglandins, prostacyclins, thromboxanes, leukotrienes, etc.) that play a role in the intercellular signaling that directs, among other key activities, neurological function and immune response – including inflammatory response. (Eicosanoids are also derived from EPA in the omega-3 family. These are considered anti-inflammatory.) Your proportion of omega-3 derived to omega-6 derived eicosanoids correlate for the most part with your dietary intake of omega-3s and 6s. Already this correspondence shows that your omega-3 to omega-6 ratio has the most significant impact on your level of omega-6 derived eicosanoids and their inflammatory effects on your system. Consider that the average American has an omega ratio of 20:1, and that’s the ball game. Studies emphasizing the detrimental effects of AA generally focus on the isolated supplementation of AA rather than the impact of supplement when balanced with a correspondingly high intake of omega-3. Research that does gauge the impact of AA supplementation with a high omega-3 intake shows no significant cardiovascular impact. Invited analysis and commentary for the British Journal of Nutrition (which published the original study), citing a number of studies that show little to no appreciable effect of AA on many cardiovascular health and immune function markers, concluded (PDF) that “moderately increased arachidonic acid intake [designated as up to 1.5 grams or 1500 milligrams] is probably harmless in healthy adults.” Just for comparison sake, the average intake of dietary AA in the Western diet is estimated at 50-300 milligrams a day. But there’s more reason for reassurance. Much of people’s AA content is likely determined by (and derived from) their high linoleic acid intake (in the forms of corn, soy and vegetable oils). Cut those out of your diet as the PB suggests, and you’re already ahead. As for direct AA dietary sources, chicken eggs weigh in at about 390 mg and 100 gram meat servings generally between 35-100 mg dependent in part on fat content (organ meat reach into the 150 mg range). In the context of a healthy omega ratio, the Primal Blueprint’s modest increase in direct dietary arachidonic acid doesn’t present a novel dietary risk as some (like Sears) would have your believe. Next, consider that grass-fed beef is lower in AA than feedlot beef (PDF). (Remember, it’s not just what you eat but what the cow/pig/chicken/duck/game animal/etc. on your plate ate before it got there. Stuff animals with omega-6 loaded feed and you’ll get meat loaded with forms of omega-6.) Add to this the protective (antioxidant, anti-cancer, pro-cardiovascular health) effects of conjugated linoleic acid (CLA) present in grass fed meats and dairy – up to five times the CLA as you’ll find in grain-fed animals. Next, there are the other mitigating factors of a Primal Blueprint diet. A healthy, nutrient-rich diet also has some effect on the prevalence of AA from linoleic acid conversion. Linoleic acid, the “parent” omega-6 compound, is broken down by the body into gamma-linoleic acid (GLA). From there, the conversion leads toward either arachidonic acid or dihomogamma-linolenic acid (DGLA), which is actually anti-inflammatory. Minerals like magnesium and zinc and vitamins like C, B3 and B6 appear to encourage the body to redirect GLA conversion toward DGLA instead of AA. Research shows it’s a more complicated picture – inflammatory and anti-inflammatory. And if you’re a tea drinker, know that all the steeping and sipping curbs the metabolism of arachidonic acid. Finally, as I mentioned before, it’s important to keep in mind that arachidonic acid isn’t the bogeyman that it’s made out to be. It comprises a necessary component of cellular membrane structure and supports everything from dermal integrity to muscular growth and repair. It’s no accident that arachidonic acid is present in breast milk. AA plays a critical role in brain development, and a whole host of research comparing AA-supplemented formula with non-supplemented formula underscores this connection. Likewise, AA supports continuing role in neurological health as demonstrated in studies involving older adults. When it comes to arachidonic acid, the general principle holds: it’s all about overall balance and healthfulness. Thanks as always for the great questions and comments, and keep ‘em coming! Great information. The typical Western diet is the recipe for inflammation from many angles. The terrible omega-6/omega-3 ratio is just another part of the catastrophy (and perhaps a major part of it). It’s my personal belief that a lot of the minor substances that get blamed for inflammation (and thus heart disease, etc.) are less harmful when you switch to a more natural diet like the Paleo diet. Basically, if the bulk of your diet is from natural, whole foods and includes plenty of quality protein and saturated fats, a lot of so-called “harmful” substances are essentially neutralized. It’s when you introduce these foods into a body riddled with damaged fats, HFCS, and MSG that they get the chance to wreak major havoc. I agree. One reason I think saturated fat has such a bad rep is because people are looking at its effects in the context of a diet rich in grains and sugars, which can make a good food turn bad. This topic isn’t easy to put into a post, but nicely done! I’ve always known that the ratio balance between O3 and O6 is the key, and therefore I use fish oil. But I don’t use fish oil indiscriminately. As often as I can, I eat grass-fed beef and pasture-raised animals. But I don’t do this all the time as access and economics don’t always favor them on the dinner plate every night. So on those days I eat traditional meats, I supplement with a few tablespoon of fish oil. Having a diet that’s abundant in greens and various colors, I’m confident that the AA conversions leave a healthier end product in the body. Whenever the meat/fat quality is in question (dinning out, etc. ), down the hatch goes some fish oil. I feel smarter every time I read a post on this site! As a student of life, I can say that this site is among my top three of all time for valuable, intelligent and important information. PLEASE…keep up the amazing work Mark…the value of the knowledge you pass along is beyond compare! What are the other 2 sites, if you don’t mind me asking. It’s not only pigs, chickens, cows, etc. that get fed on corn. I learned that farmed tilapia (which is most of it) is corn-fed, meaning its Omega-6 to Omega-3 balance is way off. Too bad, since it’s so inexpensive. I suspect that other farmed fish like salmon is the same way. That might be a good follow up topic, Mark. He’s touched on this several times. Just do a search up top. Salmon, bass, carp, catfish, cod etc… If it doesn’t say wild, assume it’s grain fed. gigi, 3-6-9 oils are a good concept, but mostly for marketing. Assuming we eat absolutely no fat in other areas of our diet, then this product would be very useful. But since the food industry provides an abundance of O6 (and O9), it’s better to spend your money on a quality O3 supplement. I became concerned with AA because of my rather severe osteoarthritis. I was determined to get off NSAIDs and pain meds. I take fish oil and eat a lot of wild salmon and other fish. 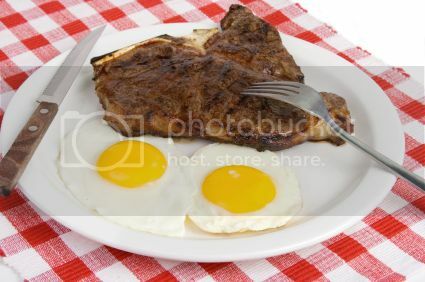 I eat only egg whites and beef is always grass fed–although I’ve been relying on bison lately. I have been off all meds for a couple of years from eating this way. A few months ago, my doctor checked my CRP (which is supposed to be a better indicator of heart issues than cholesterol). With 1.0 as the low end of the lab range, mine was 0.9–and that’s measuring inflammation throughout the body. My doctor was amazed; considering my arthritis, he expected a number at least at mid-range. Thanks for posting your experience – I find it very helpful. Thanks for the explanation and helpful answer to my question. I feel relieved to know that the PB creates the balance needed. I am following PB guidelines for healthy eating and take fish oil daily but no Omega 6 supplements, like evening primrose oil, or combination essential fatty acids. No need to add any O6’s! What’s with the whole egg whites thing? I understand we’re to cook those, but not the yolk. Yet “in the wild” how many animals cook the white before sucking and egg down? And Anita (or anyone), can you clue me in on what’s wrong with the yolk? Try using Coconut milk instead of dairy. Works great. My shake is coconut milk,an egg, pumpkin, a little vanilla and sometimes 1/2 banana. There’s nothing wrong with dairy unless you have an intolerance to either milk sugar (lactose) or milk protein (casein, maybe whey?). Which I assume you don’t, unless you have mysterious digestive problems after consuming it. So, feel free to drink up – milk is probably the only drink that truly improves on water, thanks to its high fat, protein, vitamin, and mineral content. It has a fair amount of sugar (the aforementioned lactose) but I think it’s worth including in a daily allowance of carbs. Coconut milk is perfectly fine, too, but even compared to raw, pasture-fed milk, it’s more expensive and, IMO, not really worth the trouble. As for paleo concerns, I know plenty of PB eaters are fans of olive oil, for example, which is fine to eat but certainly not paleo. Olives have been eaten for no longer than 10k years, if that, and they probably weren’t pressed for oil until a long time after that. So a few [healthy] deviations from purely paleolithic eating is fine, and nearly impossible to avoid anyway. As for eggs: there’s nothing “wrong” with the yolk; in fact, the white contains little else besides protein, while the yolk contains a cornucopia of vitamins and minerals. It also contains all of the fat (including AA) and cholesterol in the egg, which bothers some people – obviously, people who probably have never heard of (and don’t care about) primal eating and would like you to stuff yourself with grains. The reason you’re supposed to cook the egg is because it increases absorption of protein and some other stuff, but that’s only if it’s your main source of those nutrients. A few raw eggs per day are a perfectly fine addition to a good diet, I think. A GI doc once told me that the whey proteins lactalbumin and lactoglobulin are the most common dairy allergens. What I think is great is there are actually supplements out there that have AA in them to PROMOTE inflammation and give the appearance of a more ripped, vascular look in the bodybuilding world. One such product is called “Hemodraulix” by supplement maker Axis Labs. They actually put AA in their formula along with Arginine to promote bloodflow + inflammation, increasing the look of your veins. Crazy. I have been supplementing AA, via Hemodraulix, for years now. Granted, I also take Omega 3 supplements as well. Still, I never had any idea the AA might be harmful. I have a physical every year, and my doctor knows everything I take, and I have been perfectly healthy despite what alarmists like Dr. Sears might say. I have cycled the Hemodraulix because I noticed an unexpected effect. I had anticipated being extremely sore after workouts supplemented with AA. In my case, I actually found myself not sore at all, even after the most intense of workouts. That meant that I didn’t run into a formerly common problem for me. That being that I would still be sore days after a workout which considerably decreased my desire to workout as often as needed. I have no doubt that the AA supplementation has made all of the difference for me. I’d also add that AA is only a precursor molecule for other immune-regulating molecules, such as prostagladins and leukotrienes. Some prostagladins are pro-inflammatory while others are anti-inflammatory and down regulate the immune system, therefore it depends what your body converts the AA to. It’s also worth noting that inflammation, like cardio, is only bad when it’s chronic. * The occasional inflammatory response to injury is necessary and part of the body’s healing system. *Comparisons end there, though. Cardio is not necessary! Yes, Brian Peskin has me really thinking about this topic; turned upside down. Basically he says we get too much DAMAGED omega 6, which leads to cell wall damage (decreased cellular oxygenation, leads to cancer per Warburg) and, eventually cancer or other diseases. To counter all this we need pure, organic, undamaged omega 6 in a 2:1 ratio to omega 3. He stresses we don’t want to take the derivatives of these EFA’s because the body only converts, at most, 5% of the EFA to derivatives based on need. So, if you need the derivative your body will convert, and if you don’t need it but supplement with derivatives you are taking a pharmacological overdose. He’s very controversial, but he does seem to have his science in order. His marketing, and arrogance get in his way. He tells you in the book how to mix your own oil, but does appear to be linked to a supplement company, which makes one wary; however, Mark, the Eades, and any variety of people I generally trust also sell books, supplements etc. Anyway, I’m reading his books and he supports everything he says. I wish I could hear from a real scientist, who has read Brian’s stuff, and could really debate its merit. The only stuff I can find seems to be disparaging remarks about Brian’s personality or complete dismissal without reading, carefully, his work. Brian Peskin IS a real scientist and only pharmaceutical companies including sites like quackwatch.com made him very “controversial”. Why?… because what Brian Peskin has to say is absolute right. People are starting to look after themselves more, which is less profit for the pharmaceutical companies. I have communicated with Brian Peskin via email many times and he had ALWAYS been there to answer any questions I may have. Because of Brian Peskin, I am able to maintain 7 to 8% bodyfat all-year-round and faster recovery ability due to PEO (Parent Essential Oil). As for marketing and promoting supplements, Mark Sisson does the same with his book by refering it as “Primal Blueprint” etc. No different. We all have to make a living somehow. I tend to lean more toward Brian Peskin to confirm a theory since many other writers including Mark Sission expressed their opinion or experience NOT scientific fact. so are all omega 6 fats created equal? aka should I watch my pasture raised turkey fat in take as well as my nut intake or are those more essential? Actually, arachidonic acid may have little to do with ones intake of linoleic acid. All the same then, it probably isnt the boogieman that its sometimes made out to be. Increasing dietary linoleic acid does not increase tissue arachidonic acid content in adults consuming Western-type diets: a systematic review. Linoleic acid is associated with lower long-chain n–6 and n–3 fatty acids in red blood cell lipids of Canadian pregnant women. Dear Mark, I would like to begin by saying how helpful your article is. It amazes me how much information there is about arachidonic acid (AA) and it’s many actual and potential influences on our health. It further wows me at how every discipline looks at something slightly different. As an aspiring bodybuilder with asthma I’m concerned about the association of AA with the inflammatory response. To make a long story shorter, I am recovering from a severe case of lung inflammation attributed to several bodybuilding supplements along with cheap, farm-raised tilapia, and many eggs and egg whites. I would like to go into some detail, however I’m not sure what space is allocated here for replies. Because of this I will stick to the facts. I currently take theophylline by mouth daily,a Proair inhaler for acute asthmaticus, and a corticosteroid inhaler Symbicort to prevent attacks. The supplements I was taking are as followed: L-arginine, a Nitric oxide booster, and a post-exercise supplement pack of 8 different capsules. I was on this cocktail for fourteen to seventeen days. During which time I was out of my Symbicort inhaler for one month. Needless to say, this was a big no no. I should have done some research on these chemicals and food before beginning such an intense regimen. I did go to my doctor and was given a corticosteroid injection and some samples of Advair to get me by until my Symbicort came in. I did not mention any of the supplements I had been taking to my doctor out of shame. I believe that this response was the sum of all these factors. The inflammation also caused some pre-hypertensive blood pressure readings. I’ve never had any bP issues in the past, even with a history of asthma from three months of age. On the positive side, I’m back on the corticosteroid and I’m getting better day by day. What concerns me now is when I’m fully recovered, how can I avoid this from happening again? Afterall asthmatics are more susceptible to hypersensitivity reactions than other people. By the way, those supplements went into the garbage days ago. Our body makes all of that it needs anyway. Would a good start begin by going to grass-fed meats, chicken, and eggs? And as far as fish, make sure it’s wild and not farm-raised? And finally, will these foods be safe eaten in the quantities that bodybuilding demands? Maybe find a really good holistic M.D. you can trust and work with him/her? What about the effects of AA on the prostate? Its oxidized fatty acids that cause oxidative stress to the cells, which leads to cancer. Botchy explanation by someone who doesn’t understand the science. Ratio in nature? Yea right! Don’t touch anything processed and you wont have to worry about lipid peroxides from these foods; this includes fish oil. My complaint is the nightmare headaches I started getting after eating eggs. I love eggs and miss them so much. The headaches last 2 days are tor-tu-ous. I was wondering if the eggs from chickens fed completely non-grain sources would cause the headaches. ” Linoleic acid, the “parent” omega-6 compound, is broken down by the body into gamma-linoleic acid (GLA). From there, the conversion leads toward either arachidonic acid or dihomogamma-linolenic acid (DGLA), which is actually anti-inflammatory. Minerals like magnesium and zinc and vitamins like C, B3 and B6 appear to encourage the body to redirect GLA conversion toward DGLA instead of AA. That reads as though people SHOULD avoid it, at least to my eye. How come nobody in the Primal community has yet pointed out (that I’ve seen) that aspirin literally shuts down the process of making inflammatory prostaglandins, and destroys the substrates, while other NSAIDS just temporarily and reversibly give you a break from that pathway? It’s pretty technical, but if you search for some lecture notes from a pharmacy class…. try, “Welch AA Cascade” or “The Arachidonic Acid Cascade” It’s a PDF…. you will learn more about inflammation than you wanted to know. I’ll let each person decide for themselves how they will handle the inflammation issue. The point is, you should feel well and good every day, not like a truck ran over you. Eating fish is primal and makes everybody happy. I suffer from Samter’s Triad which comprises asthma, nasal polyps and aspirin allergy. The root of this condition is believed to be a disturbance in the process of metabolizing AA. The natural aspirins in food (salicylates) depress COX1 and COX2 enzymatic function. These are part of the arachidonic acid cascade and if they don’t function properly, a ‘sideways shunt’ of the AA happens that results in more inflammatory metabolites. When the AA cascade is functioning properly you won’t have any symptoms of increased inflammation. However it is likely that supplementing with Aa enables the inflammatory route to some extent. Yes you can offset this by increasing with omega 3 oils (which compete with AA for certain rate limiting enzymes). The very worst diet I can consume is the Paleo diet which is very high in both AA and salicylates. Treat AA with respect. It is at the heart of the inflammatory system. If you are healthy, don’t mess with it. Eat more oily fish and reduce poisonous vegitable oils but that’s eat. I would like to add an amendment to my previous comments. There is no scientific evidence that a low or non salicylate diet has any positive effect on Samters Triad. If you are suffering from this horrible condition then you don’t have to avoid sals in food (other than to manage itching). By restricting your diet in this way you are avoiding many delicious and healthy foods with (probably) no benefit to the underlying AERD. Should one go on a low salicylate diet and avoid egg yolks as well, according to what you are saying? This is interesting. I read on the Skeptical Nutritionist website that conversion of linoleic to AA is tightly controlled by enzyme availability. This would make sense because the body regulates most processes. Also, there was an experiment where people were dosed with large amounts of AA and nothing bad happened. I’m currently reading an article about how AA and linoleic are cytoprotective; directly converted by stomach mucosa “Fatty acid-mediated gastroprotection – Mandel KG”. There was also a study done in Mexico that showed stomach cancer was related to linoleic insufficiency..Unfortunately, stomach protection is based on the same inflammatory prostaglandins, which is why NSAIDs are so bad. I also don’t believe any of the omega3 studies done on rats, due to rats eating 6 times what we eat, they deal with most micronutrients as toxins. If a rat has high omega3, it may just be tolerating the toxicity of it. It may not be an example to humanity. Have you considered including scientific articles, or do you only do it when it suits you? If you have aspirin sensitive asthma be *very* careful about increasing your omega 3 intake at the expense of AA. Fish oil supplementation has put me in hospital twice! It is a gross over simplification to categorize all omega 6 metabolites as proinflammatory and all omega 3 as anti inflammatory. They work together in a extremely complex orchestration of biochemical signalling, genetics and nutrition.